This week Capcom, the popular publisher behind Street Fighter IV and Resident Evil 4, has released their latest title: The Smurf's Village. This title follows the tried and true model of Farmville and the countless other similar games out there. It's a free game, where the player has to build his or her town and maintain it. You build farms and plant various food types, build houses, and other various buildings. Then you have to harvest your crops, and level up as you get coins and experience. You can also use real life money to speed things up, as usual. The basic features are all well known, but the game does bring in various interesting features. For one thing, it has quests, sort of. Papa Smurf guides you along the first few levels, but then you can talk with the various well known Smurfs who will all interact with you in some way. There's also minigames, such as shaking the device to help create potions. This certainly help diversify gameplay. 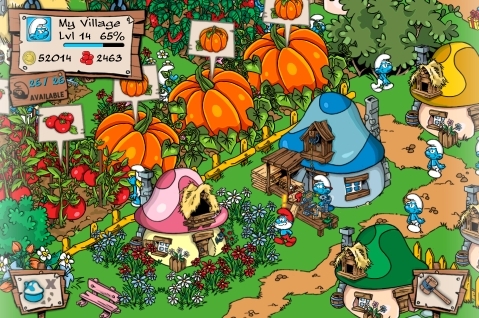 As with other similar games, this one also has a social aspect, where you can 'visit' other people's smurf villages. You can invite friends from Facebook, but there's no other way to add people like the Plus+ network in WeRule or anything like that. If you don't have a Facebook account the social aspect will be severaly diminished for you. Still, even if you don't have any friend playing the game, there's an option to visit a random village on the map. The graphics are very stylized, very well done and follows the original TV cartoon. Overall this is clearly a game aimed at kids, and is very easy to get into. The quests are clearly explained, and the objectives are clear. It's not a game that many adults would like, but for the target demographics, I could see it being a hit. Try it out now for free on the App Store, both for the iPad and iPhone.